A lawsuit challenging the state ban on outdoor advertising along highways is making its way through the courts. While that’s happening, small, temporary political signs could remain on private property. The state has suggested the court allow it to continue the ban on billboards along public roads. But the state also told Superior Court Judge Herman Walker Jr. that it would agree to limiting some enforcement while he hears the lawsuit. Judge Walker hasn’t ordered any changes yet. The American Civil Liberties Union of Alaska and the group Dunleavy for Alaska sued to stop enforcement of the law. Department of Law spokeswoman Cori Mills said the lawsuit shouldn’t stop the state from continue to enforce the 69-year-old ban on highway billboards. Voters reaffirmed the ban in a 1998 ballot measure. “It’s the state’s position that in order to uphold the intent of voters to not have billboards on Alaska’s highways, that we should really deal with the focus of this lawsuit and this election season, which is the small, temporary political campaign signs that people tend to put on their private property,” Mills said. The state suggested that it continue to allow signs that are smaller than 4 feet by 8 feet. It would continue to enforce the ban on signs that affect public safety. That includes signs that block stop signs. The state also said in court filings that Eric Seibels wasn’t affected by the state enforcement. He’s a Palmer resident who joined the ACLU and Dunleavy for Alaska in the lawsuit. 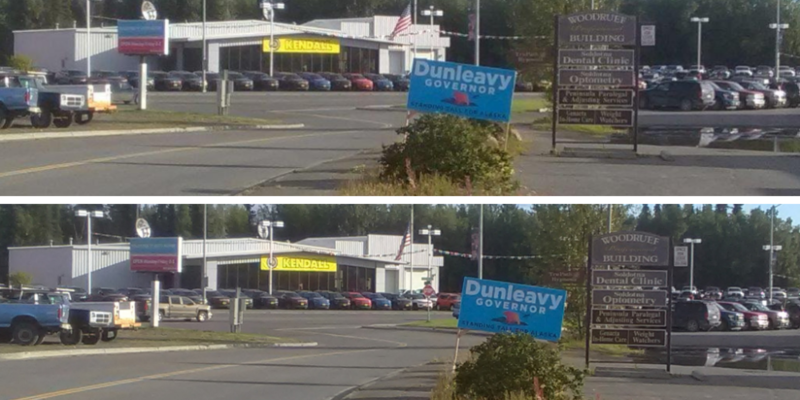 He has a Mike Dunleavy for governor sign on his property, but his property isn’t along a road subject to the state ban.